Great Marlow School believes that all students should have access to careers education, information, advice and guidance. GMS have put in place access to information that will help students choose suitable pathways to careers options. Jobs that offer personal, economic and successful sustainable employment will lead to fulfilled lives. Staff, together with careers advisors work to raise student aspirations and help strengthen their potential and resilience by delivering Career Focus events, like work experience, and Careers’ Week, culminating in a Careers’ Day that has representatives from many professionals making a pitch about their speciality. Everything GMS does in the careers field supports learning, informs careers options and embeds personal qualities. GMS are proud that 100% of our students progress onto further and higher education, training, employment or apprenticeships. The information about the careers advice at GMS is updated annually at the start of the academic year. Mrs Southon is the school’s Career Guidance and Information Adviser: she is available to meet with students one day a week, in her office located in the Sixth Form Centre. Mrs Southon has a background working in business and charities within Human Resources, where she successfully ran Apprenticeship and Management Training Schemes for young people and delivered career management skills workshops for professional and support staff. In 2010, should completed her Postgraduate Diploma in Careers Guidance at Reading University (Dip CG, QCG) with Distinction. As the holder of a Level 7 appropriate Careers Qualification, she exceeds the Gatsby Benchmark requirements for a professionally qualified Careers Practitioner within our school. She is also licenced to administer and giving feedback on a range of Psychometric Tests, including MBTI Personality Questionnaire. 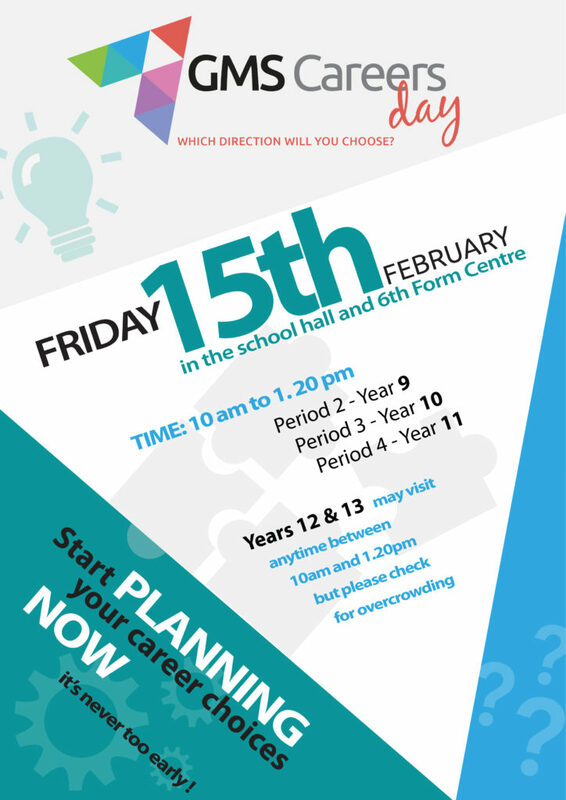 Careers Information and Advice will also be available to parents and students at GCSE Options Evening, Parents’ Evenings, Annual Careers Fair and Sixth Form Events. 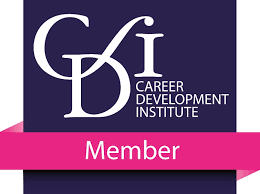 Mrs Southon is a Full Member of the Career Development Institute (MCDI) which is the single UK-wide professional body for everyone working in the fields of careers guidance, advice, education and coaching. There has never been a time when Careers Education, Information and Guidance (CEIAG) has been as important for young people as it is today. The landscape of education, training and employment opportunities that students need to navigate is more complex and more challenging than that faced by previous generations. Our mission statement is for all students to achieve their personal best. In careers education, this translates as every student making the right choices for their progression. At GMS we aim to support students in making well-informed decisions by providing access to differentiated, impartial and independent information and guidance about the range of options (including academic, vocational, apprenticeships) that are most likely to help them to achieve their ambitions. By helping students with decisions at crucial stages, informing them of all their options and introducing them to the world of work, we aim to prepare them for their career future whichever pathway they choose. 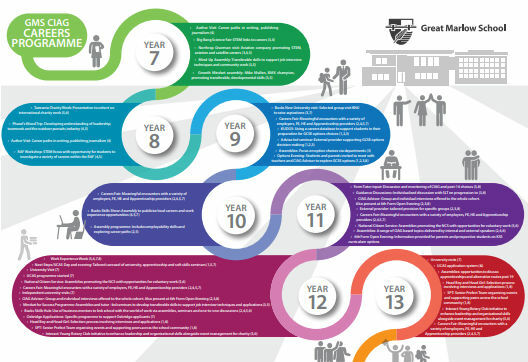 The GMS Careers Map (link to Map on site? ) sets out how the Academy provides a careers programme through Key Stage 3 to 5 which provides our students with the knowledge and inspiration to succeed in their chosen career paths. 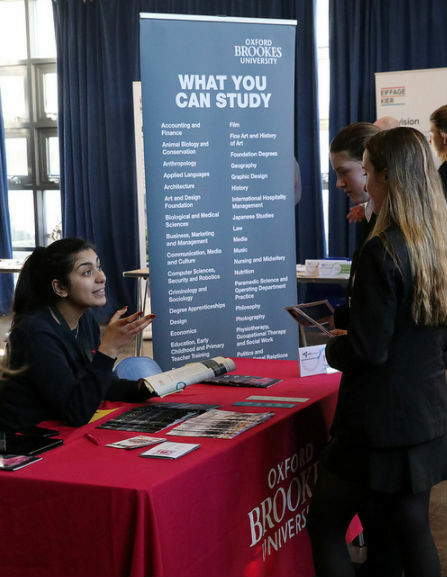 On Friday 15th February, a variety of different businesses, educational establishments and vocations were invited to attend the GMS Careers Fair. The exhibitors ranged from the armed forces to apprenticeships, ICT to Higher Education and Accountancy to Childcare. The Career Fair was the culmination of a week in which all students in each year group had discussions with their subject teachers about how their studies linked to careers paths. In addition, each student who attended was given a preparation sheet which gave information about each exhibitor and the chance to prepare specific questions. All students from year 9 through to 13 were given the opportunity to visit the thirty stands housed in the hall and the sixth form centre, to ask questions and discuss their potential career paths with the experts, collect information and take the free gifts made available! The day was a great success and, for many students, provided a first opportunity to really consider their futures. National Careers Service https://nationalcareers.service.gov.uk/ – a Government organisation which helps find out what a job involves and if it’s right for you. 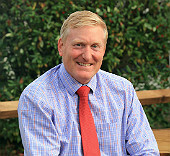 icould https://icould.com/ – Listen to people from accountants to zookeepers tell their own story about their real life career journeys. UCAS https://www.ucas.com/careers-advice – If you are confused about the options after school, college, or sixth form? The UCAS website covers all you need to know about the routes available to you, to help you decide what to do next. In Great Marlow School all Year 12s complete a one week work experience placement. In order to minimise disruption to studies, this takes place at the beginning of July: the exact date is advertised at the beginning of the academic year. GMS believes in the value of work experience because, firstly, it offers a unique opportunity to experience a workplace environment that could impact on a career choice. Secondly, students can reference the work placement when applying for UCAS, apprenticeships and jobs. Thirdly, some placements may, and frequently do, lead to part-time employment. To give students ownership of their placement, they are asked to arrange the place of work themselves. They are expected to pay travel costs, which must be factored into their decision. Often a CV and an interview are required; this is good practice and the school encourages employers to do this. To support students through the process there is a section in The Next Steps Guide available on the website, under the Sixth Form tab. Finally, formal paperwork has to be submitted to the employer at the time of the placement. Students are encouraged to speak to parents, carers, family friends, peers (like Year 13 students), Connexions, tutors and the sixth form leadership team to ask for help and advice. The best placements have taken into consideration what the student’s intentions are at the end of Year 13: it is important that placements reflect a student’s interests, educational strengths and long-term career choice. The placement should be challenging, unpaid and different from any part-time work engaged in by the student. STEM stands for science, technology, engineering, and mathematics. STEM is important because it pervades every part of our lives. Science is everywhere in the world around us. Technology is continuously expanding into every aspect of our lives. Engineering is the basic designs of roads and bridges, but also tackles the challenges of changing global weather and environmentally-friendly changes to our home. Mathematics is in every occupation, every activity we do in our lives. By exposing students to STEM and giving them opportunities to explore STEM-related concepts, they will develop a passion for it and hopefully pursue a job in a STEM field. A curriculum that is STEM-based has real-life situations to help the student learn. Programs like Engineering For Kids integrates multiple classes to provide opportunities to see how concepts relate to life in order to hopefully spark a passion for a future career in a STEM field. STEM activities provide hands-on and minds-on lessons for the student. Making maths and science both fun and interesting helps the student to do much more than just learn. At Great Marlow school we actively encourage our students to study STEM and provide opportunities throughout KS3 and KS4 to inspire their interests in this field. The Science department took a group of year 9 and 10 students to a careers day at the software company SAS. This fantastic opportunity was part of Tech Week, an initiative aiming to drive the next generation’s interest in studying STEM (science, technology, engineering, maths) subjects and joining the Tech industry.It provided the students with a great insight into how a global business works, career information, and workshops. In the afternoon, students will got the unique opportunity to take on the role of business analysts and solve a real life business problem using SAS Visual Analytics. During Science Week a workshop on scientific thinking and analytical skills was presented to Y9 students. During this workshop the students were challenged to investigate the spread of a fatal disease through an airport. In order to prevent a pandemic, they students had to identify the origin of the outbreak and develop a serum. We had an embryologist Danielle Breen come in from the Thames Valley Fertility Clinic to speak with the whole of Year 11 and our Year 10 triple science students. This was linked in with the GCSE specification as part of their Homeostasis and Response module. Students learnt from an expert how IVF treatments were carried out from start to finish, how the body is manipulated with synthetic hormones, the success rates of average IVF cycles and they debated the ethical issues surrounding the process. This fitted in really nicely with the careers fair that the students visited that day. The Year 7 cohort went to visit the Big Bang Fair held at the Birmingham NEC. The Big Bang Fair is an annual event that invites an enormous range of companies, universities and most importantly students to come together and enjoy the world of Science. At the fair, our Year 7 students had the opportunity to visit different stalls and speak to many adults working in STEM Careers, as well as taking part in many experiments! The fair included many interactive shows, demonstrations and activities. A great day out was had by both students and staff alike with many of our students wishing they could have stayed longer!